Whenever I mentioned about my visit to Fuji, the immediate assumption by most people would be that we attempted to hike Mt. Fuji. As much as we wished we could, we certainly were not ready for that - no proper attire, no prior preparation, nothing. Fuji is not solely all about Mt. Fuji, there is more than just that and that's why my post is going to be about. Our visit to Fuji was a short 2D1N but we really wished we extended our trip there. Nonetheless, here's our take on "What to do at Fuji!" Our sole purpose to visit this time round was actually for Fuji-Q Highlands. Since we were coming down from Tokyo, I am very thankful we found out about the existence of the Q-pack. You would have to book your tickets online first (here!) and that's just for reservation purposes. We made our payment and collected our tickets at the Shinjuku Bus Terminal (which is where we boarded the bus too on the day itself). Our bus tickets + full access pass ticket came up to ¥7000/pax. That's quite some bit cheaper than getting those separately so would highly recommend that. Photo credit to all individual owners for photos of Fuji-Q and their rides. 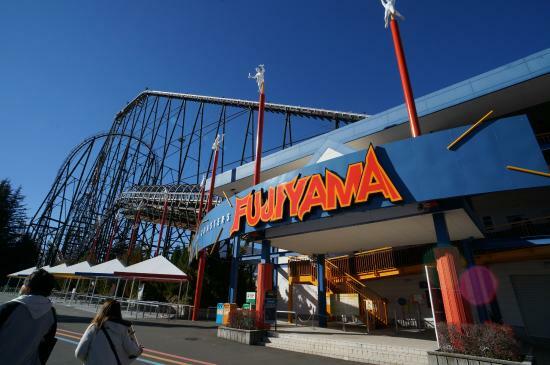 If you're an adrenaline junkie who has a big love for roller coasters, you'll probably have already heard of Fuji-Q Highlands. The moment we alight from the bus, we were greeted with insane looking tracks and tons of deafening screams; can you blame them? This place is after all the home to 4 record breaking coasters - Takabisha, Eejanaika, Dododonpa and Fujiyama, which we had to sit no matter what. Amazingly, this ride only comes with a half height back rest and a safety bar that holds down at your thighs considering how this ride features a maximum drop of 70m, maximum height of 79m and all these at a maximum speed of 130km/h. Since it was our first time, we were excited with our hands lifted but now we know why no one does that throughout the ride, at some point, we felt like our shoulder up was flung all around and we had issues bringing our head upright which was shown in the photo captured by the way. The ride took unexpected turns and I have to love how the ride concludes, very unexpected which is still a big thumbs up for me cause I love surprises. However, I would prefer if the ride had better backing. 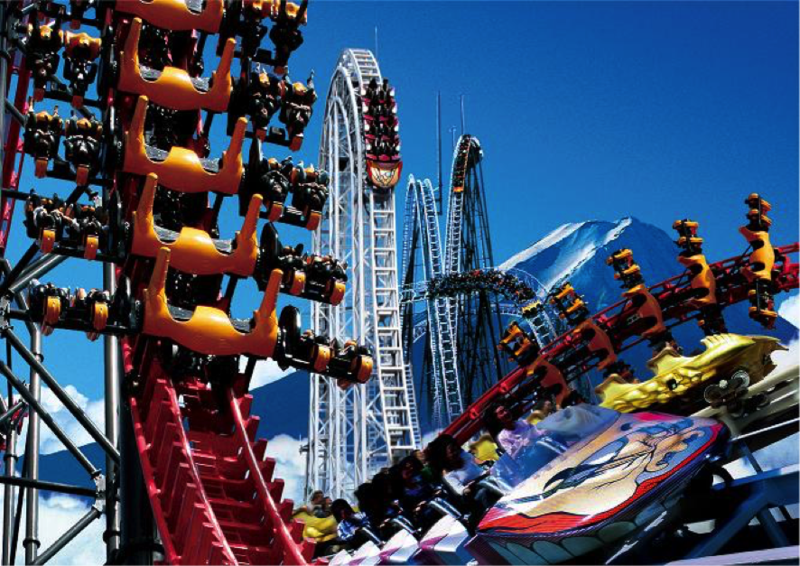 A ride that brings you thrill and gets your heart pumping throughout the ride. 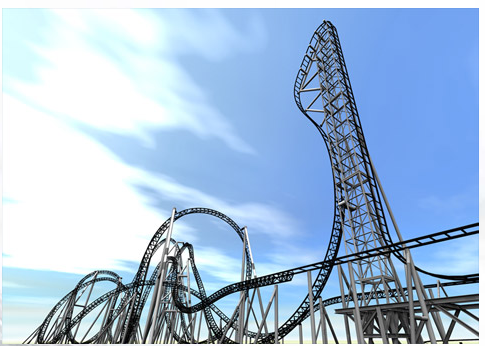 As you can see, the ride features a vertical ascent towards the sky before it slowly tilts a little downwards to kill you a little every second and finally the long-awaited 121 degree free fall drop. Best part of it, that's not the only thrilling part but I shall not spoil it for you. BEST . RIDE . EVER. MY. FAVOURITE. OF. IT. ALL. It was what my sis and I were most jumpy about seating but its the same ride that never failed to give excitement that we went for it twice. 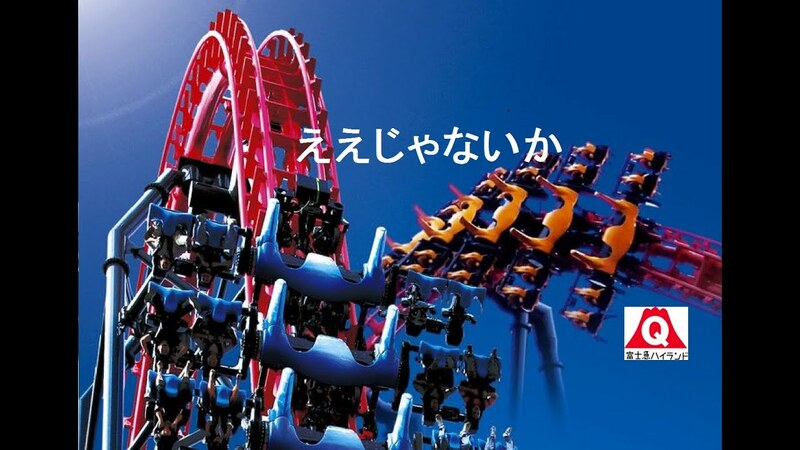 Usually you'll hear screams in all languages since it's in Japan but it was hilarious when we shared the ride with a group of exchange students, so that's probably 7 out of 8 English speaking individuals on the ride. Right before the ascent, all that was going on was things like "nope we're not done yet" "I need my mum", "f*** this sh*t" and tons of "oh my god"s.
most number of spins in the world. TBH, I absolutely love this too. Okay, I love almost every ride but this particular ride features, not only are there loops and twists but even your seat is spinning and guess what, your legs are dangling so woohoo. Lucky us got the last row which meant we had superb view although we had no clue where we are and what we're seeing from the first drop which was just mere seconds into the ride. The queue for this is the longest I heard since it just reopened. Up to 3hr if you visited during peak hours but we waited about half the time so thats a plus. What caught our attention at first was the fact that we kept hearing screams but by the time we turned, we have no clue where the coaster went. lol. The ride starts off with a bammm at 180km/h and it now features a loop! (it used to be a drop). The speed somehow just bring thrill although it doesn't seem like much but it's different when you're on it, so yes, do give this a try if you have the time to. I came across Hostel Mt. Fuji and because of all the good reviews it received, I chose to book a night at this place rather than others although they were slightly nearer. We actually walked! to our accommodation with the aid of google maps. The place gave a very homely and cosy feeling the moment you stepped in and was very very clean. The hostel had all the necessary amenities, a little common area and even Yukata available for guests to try on. However, what makes this place very different from the rest is definitely the host, Machiko. She was such a nice host to have. My sister and I were really worried about our itinerary as we didn't do much research as to what to do at Fuji since it was quite last minute but thank God for her. Machiko provided all the necessary information about the place, how to go around, all the attraction - where to go for the best view of mt. fuji and so on so forth, and food recommendations even which made everything so so much easier. In comparison to many other hostels I've stayed at, this hostel has got to be one of the most personal and it made me feel like home more than anything and if given the chance to again, I would definitely choose to book my stay here again. Coming soon: Click for Part II of our Fuji Trip here.